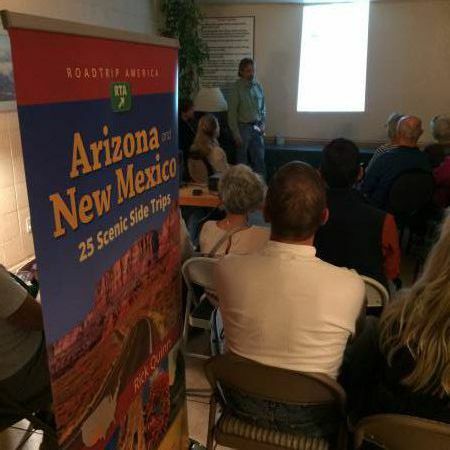 Last night I attended the book talk and signing in Tucson by Rick Quinn for his new book, “Arizona & New Mexico:25 Scenics Side Trips”. It was well attended at Mostly Books and besides meeting Rick, I also got to meet AZBuck. The book is excellent, so well written with great details and beautiful photographs. I could say it was so well done that upon getting a copy I immediately planned a trip based on his information. Actually we’ve trying to get over to New Mexico for several months, but had problems scheduling a week to get away. A couple of weeks ago we carved out this coming week for a road trip to New Mexico. We won’t be completing any of his loops, as written, but we will be criss-crossing several of the loops. So, I thought I’ll fashion this RoadTrip Field Report around his book. So getting his book is just in time for this trip. We head out tomorrow, Sunday. Not sure I’ll be able to post along the way, but will update when we return. It was a pleasure to meet you the other night (not to mention AZBuck and Jaimie)! The main reason I wrote the book was to inspire other travelers to have adventures they might not have had otherwise, and to promote the kind of "off the Interstate" road trips that have always brought me so much joy. Here's to the freedom of the open road: scenic byways, spectacular sunsets, and all the beauty in the world. We're looking forward to your trip report. I hope you have a wonderful time! 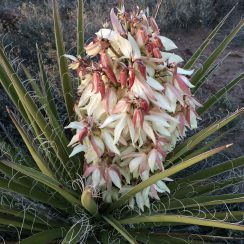 As you may know, Rick writes a monthly article with insider tips about taking road trips in the American southwest and beyond. 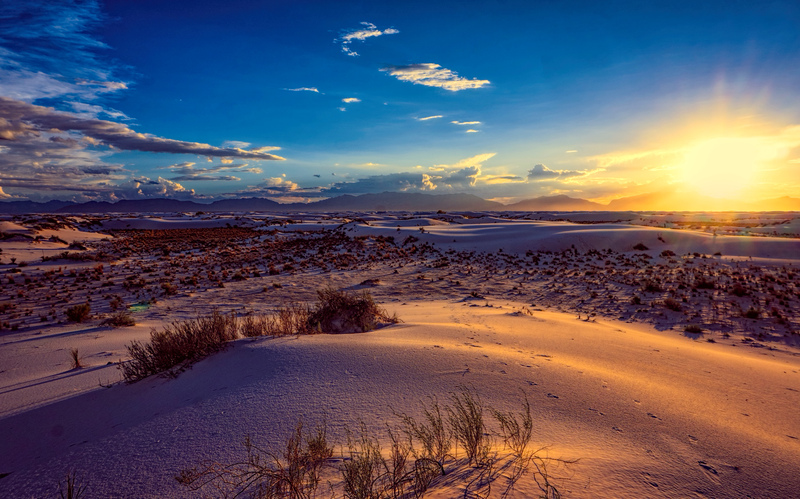 Today's post has some gorgeous photos captured at the White Sands National Monument in New Mexico. The timing of Rick's book and talk could not have been better for my wife and myself. Our plans for a late summer getaway from Tucson's heat recently fell through and we had already more-or-less decided on a staycation instead. But when we got home after Rick's presentation and started going through his book, we decided to look further into some of the nearby New Mexico locations he describes (and photographs) so well. There is so much that remains out of sight to the usual guidebooks that concentrate on the 'must see' venues, and it takes a certain mindset to realize that many 'must see' sites lose their luster when you have to fight crowds just to get near them. 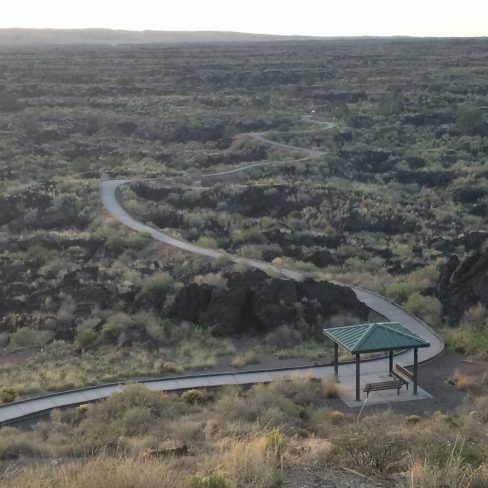 Thank you, Rick, for pointing us to some of the just as noteworthy places where one can still enjoy magnificent scenery, significant history, and wonderful open spaces that are still in their natural setting. Thank you sincerely for the kind words! Coming from an RTA Guru and Moderator, that truly does mean a lot! My book IS different from the usual travel guide, and I was initially concerned that people wouldn't appreciate those differences. Based on the many wonderful reviews we've received, and ongoing positive commentary from experts like yourself, I think it's safe to say that I needn't have worried! This trip was for us to achieve several goals based on our diverse hobbies; letterboxing, passport stamps (NPS, BLM, NWR, & NFH), historic post offices and enjoying natural history along the way. Based on Rick Quinn’s “Arizona and New Mexico: 25 Scenic Side Trips” I thought it would be interesting to match our route with the book, where they crossed. What it did show me is there is so much in Arizona and New Mexico to explore. I am in awe of Rick’s book; the routes, the details he provided and his selection of side trips. So this will be our trip, with side notes relating to Rick’s book, with pages cited. We left Tucson, from the east-side, and picked up AZ 77 at Ina and Oracle Rds., (p. 117 - 120). 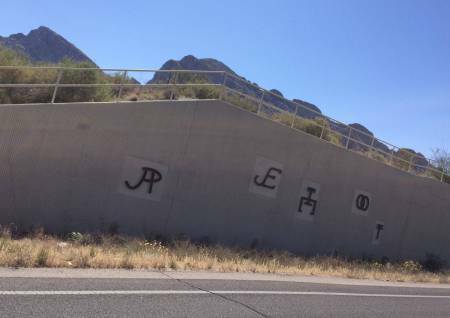 While traveling through Oro Valley, a northern suburb Tucson, I took a picture of the ranch brands mounted on a concrete wall along the side of the road, at the entrance to a Hilton resort. We only followed Scenic Side Trip (SST) #8 for a short distance until we peeled off and continued on AZ 77, passing Biosphere 2 then traveling through Winkleman, to Globe. 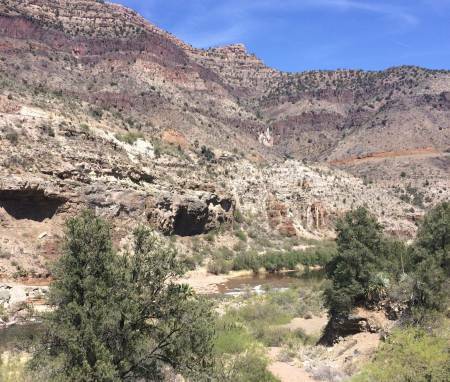 From there we picked up US 60 heading NE into Salt River Canyon, SST #11, (p. 165-169). The book gives some great background on the Salt River Canyon. 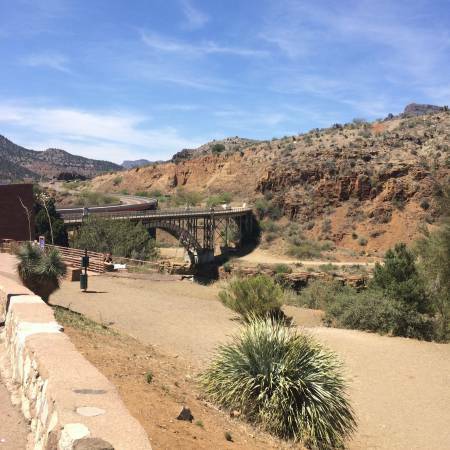 He mentions the rest area at the bottom of the canyon, a favorite stop of ours. 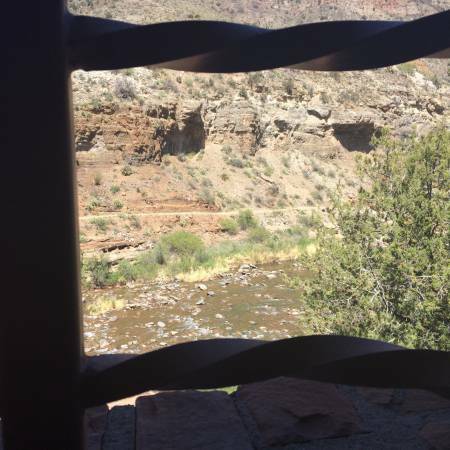 View from the restroom at Salt River Canyon - best view from any restroom! 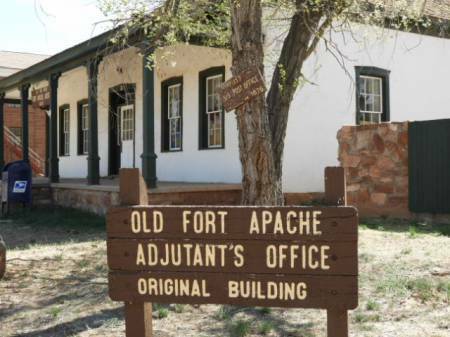 Before reaching Show Low we turned off US 60/AZ 77 to stop by Fort Apache for a historic post office picture. 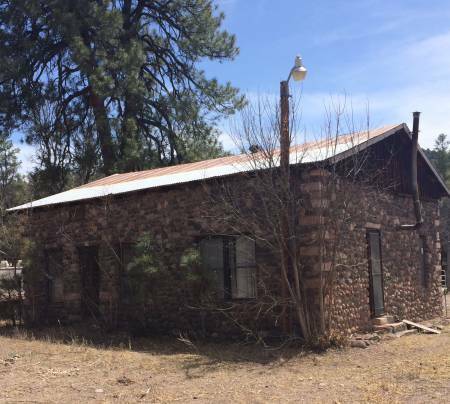 My husband is building a website to provide pictures and dates of any building in Arizona that is over 50 years old and was a post office at some point during its existence. The drive around Ft Apache is interesting, interpretive signs are in front of all of the buildings, giving great details. During the week a visitor center is a good place to start your visit. From the information my husband has, this may be the oldest post office building in Arizona in continuous use. Before ending the day we stopped in Lakeside-Pinetop for a short hike at the Billy Creek Connector, it brought us to a lush overlook down into Billy Creek. Great trails, well signed throughout this area, as part of the White Mountains Trail System. We ended the day at Show Low County Lake Campground with a campsite in the pines. For $30 we got a spacious site with electricity and access to showers. It was much cooler than Tucson, at 6800 ft, so the electric was nice to be able to run our small heater for evening reading. I would like to be on the road too! Thanks for the kudos for Rick's book. I am loving it that you are posting a report using his book! Sorry about the photography hassle. There is a PM from me with another suggestion. A pleasant, and very quiet evening at the campground. We opted to take advantage of the Denny's just around the corner from the campground. With their 15% AARP discount and smaller portions for breakfast, and a warm place to be in the morning it was a win-win that morning, the low was 37 degrees. From Show Low we were heading east into New Mexico, with a couple of stops before leaving Arizona. We continued east on AZ 260, along the Mogollon Rim, a geologic feature which extends across Arizona for 200 miles and forms the southern edge of the Colorado Plateau. We took a side trip to Hawley Lake, within the White Mountain Apache Reservation, and often the coldest temperature in Arizona during the winter. The drive south, off of AZ 260, was very scenic and lonely. I think we may have only seen two other vehicles during the 20 mile round trip, off course it is off-season for this summer resort. We were there to take pictures of the post office, now closed. 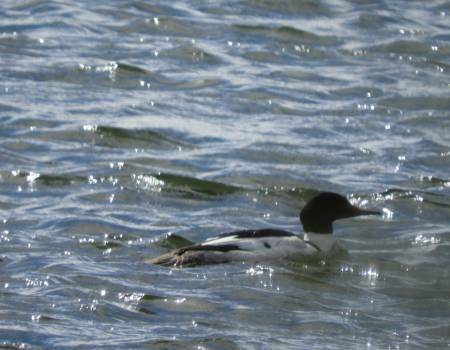 One of my favorite wildlife sightings is of Common Mergansers which we saw along the lake. 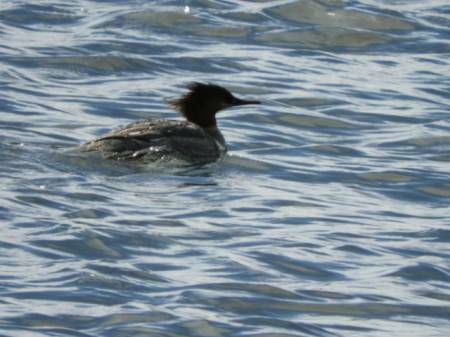 Not a great picture, too long of zoom, but not a common sighting in Arizona. 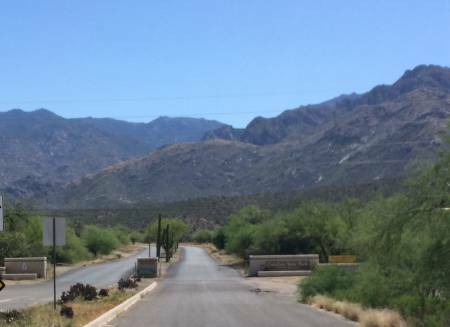 Continuing on AZ 260 we turned south on US 191 where we briefly joined SST #3 at Eager. We didn’t take the Big Lake loop, where we have camped several times over the years. Too cool for that, plus none of the campgrounds in the area until later in May. Before we reached Eager we crossed a meadow at 9,000 feet and a view of the Sunrise Ski Area, also part of the White Mountain Apache Reservation and with some snow still present. The road between Springerville and Alpine is a mild section of US191, Rick’s book does an excellent job of describing (P 55 - 58) the not-so-mild section of this road, also called the Devil’s Highway, south of Alpine into Morenci. It is a section we have driven numerous times over the years, the number of hairpin turns that Rick writes about is spot on! We love that road and agree that it needs to be driven during the day time. This trip just took us 11 miles south of Alpine to a turn off onto FR 58 which lead to Red Hills Rd and eventually to Blue, AZ, all on dirt roads suitable for 2-WD. This takes you through the Blue Range, an area I have explored for over 40 years, starting back when I lived in Phoenix in the 70s. In more recent times we have camped at KP Cienga Campground and been treated to observing a Mexican Wolf in the meadow adjacent to the campground. The reintroduction of the wolves has been moderately successful, with opinions at both ends of the spectrum. 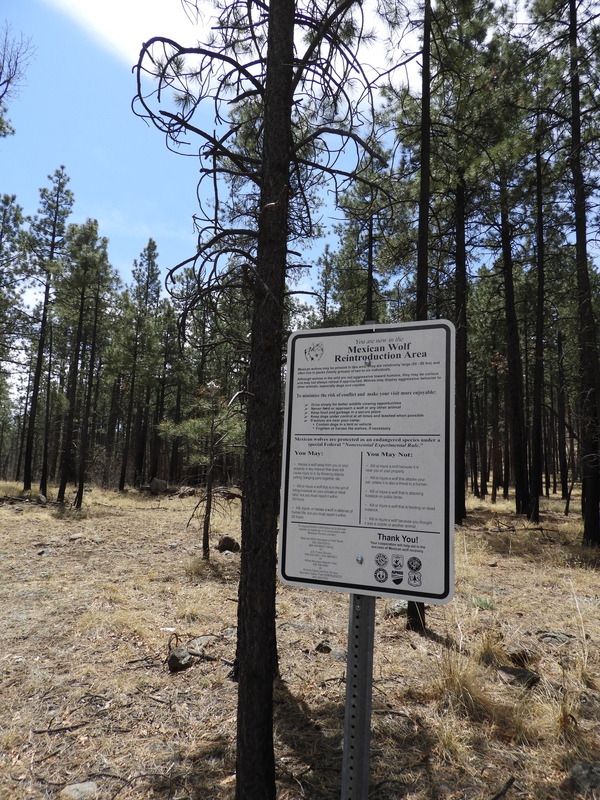 As we turned off US 191 we came across a sign about the reintroduction. Driving into Blue we left the high country and the opportunity to observe wolves on this trip. A year ago we drove this same road and made it to Blue, but did not cross the river to continue to the existing post office, the water was too high. Not much rain or snow this year so the crossing was easy and we arrived at the post office and had a delightful visit with the Postmaster (actually, Postmistress which is not recognized by USPS). 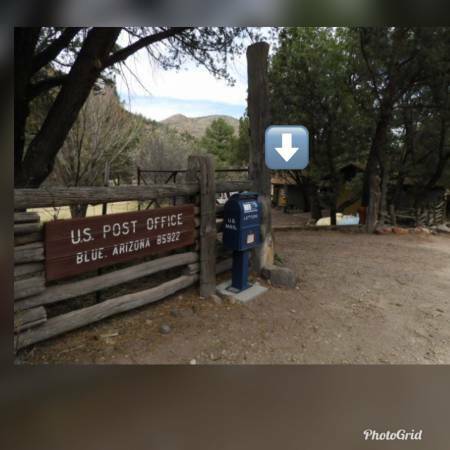 Lots of interesting history and current practices with this remote post office. We took the Blue River Road north from Blue to US 180, about 5 miles east of Alpine and back on SST #3 for a short distance to a turnoff to Reserve, NM on NM12. Today the wind was strong, we had avoided the worst of it by traveling down into Blue, but back up in open country it was strong. 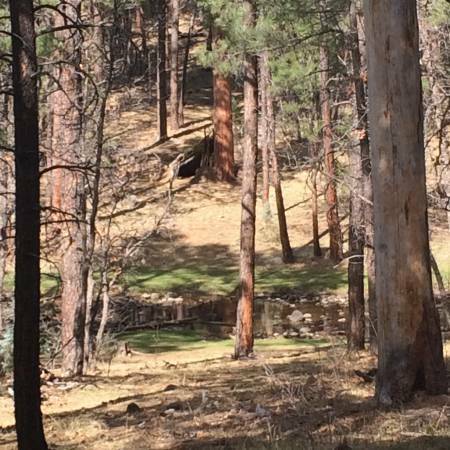 We opted for camping at Apache Creek Campground (USFS) nestled in pine trees and free! For a Monday evening we were surprised to find 7 of 10 sites occupied. This campground has a pit toilet, tables and firepits, but no water. After fixing dinner and while walking around the campground we were invited to have a drink with our neighbors. They were a group of four people in three Sprinter vans, at three levels of conversion from top dollar to basic. They were from the Taos area and met up here and were then splitting off to explore different areas. One of the people recounted his drive on the Devil’s Highway on a BMW motorcycle a few years ago, he said it was a challenge. One of them had a very friendly dog which ended the day drinking water from our bottle). 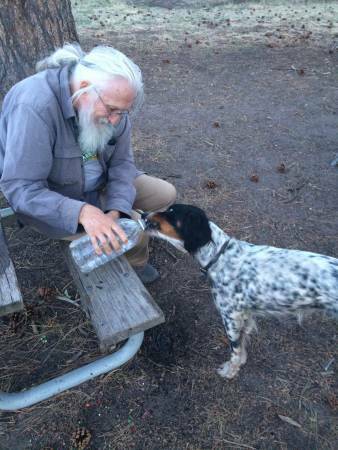 The owner assured us the dog had access to water, but preferred the hand feeding method. Last edited by Pmount; 04-26-2018 at 03:48 PM. Slept great, the wind died down, then picked up again during the night, but stayed at the treetops. However, it became gusty in the AM and made it very difficult to get the cookstove going, we did get our hot beverage and oatmeal before continuing East on NM 12. A bit further up the road we reached Datil, the BLM ( Bureau of Land Management) has a campground and small visitor center there, open March - October, and interprets an interesting piece of Western history. This area is along the old Magdalena Livestock Driveway, one of 15 water wells. The old cattle trail was established in the 1800s and stretched 120 miles from Springerville, Arizona, to Magdalena, New Mexico. At Datil we picked up US 60 and SST #19 (p. 275) driving past the VLA (Very Large Array) which we have visited on previous trips. As we were heading north once we reached Socorro we stayed on Rick’s Alternate Route, p. 281. Along the route is another unique BLM site, The Box, a quick stop. We had lunch at Socorro Springs Brewing Company, a favorite eating spot of ours while in Socorro. After lunch we headed north on I-25 to re-visit Sevilleta NWR ( National Wildlife Refuge). 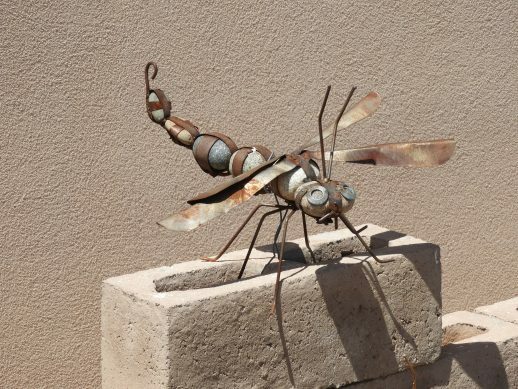 Too windy for wildlife viewing so I settled for a picture of a dragonfly sculpture at the entrance to the visitor center. 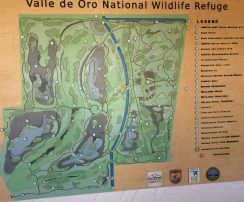 Continuing north to a new site for us, Valle de Oro NWR, which was established in 2012 as an urban NWR. It is south of downtown Albuquerque, near the airport. The wind was unrelenting and the site is under extensive development, dirt was airbound! We’ll be back to visit and explore this gem of a site, along the Rio Grande River. We continued up I-25 to Santa Fe, luckily the wind was primarily coming from the south, so we benefited from a tailwind. 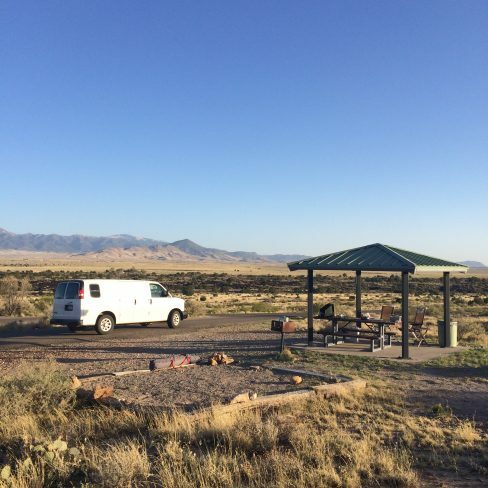 We had planned to camp at Cochiti Lake ( US Corp of Eng), ( p. 306) and re-visit Kasha-Katuwe Tent Rocks National Monument, but we needed to get out of the wind! We elected to stay at a Comfort Inn on the south side of Santa Fe. With an in-room microwave we stayed in and enjoyed the leftover fresh pasta from our lunch in Socorro. After a quiet, comfortable night out of the wind we had breakfast at the Comfort Inn. We were on road by 9, continuing north on I-25. Today’s route did not mingle with any in the book, “Arizona and New Mexico: 25 Scenic Side Trips”, but brought us to some interesting places. As comprehensive as the book is, both states have a wealth of places to visit, too many to include in any one travel guide. After Taking exit 299 onto NM 50, we headed towards Pecos, but took a left on NM 63, heading up a side canyon along the Upper Pecos River, passing Monastery Lake, open to the public, to Lisboa Springs Fish Hatchery (State of NM). The grounds are beautiful, there is a self-guided tour of the facility which raises rainbow trout. Back into town we continued on NM 50, passing a site of a Civil War battle, Battle of Glorieta Pass. 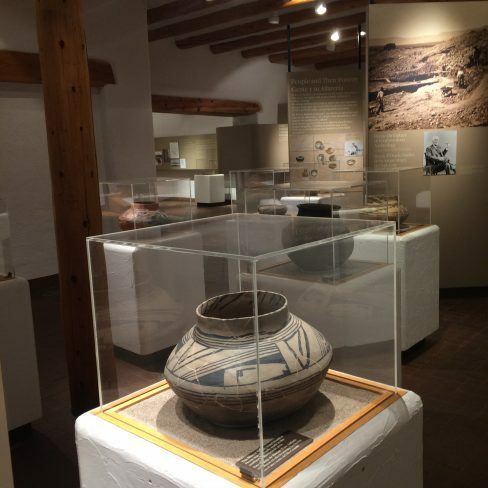 This battle, as well as the long cultural history of the area is interpreted at Pecos National Historical Park. We have visited this site previously, the cultural artifacts in the visitor center are very well presented. Back on I-25 to Las Vegas we headed further north on NM 518 to the Mora National Fish Hatchery. Along with starting to visit more of the National Wildlife Refuges we have added the National Fish Hatcheries, as well. 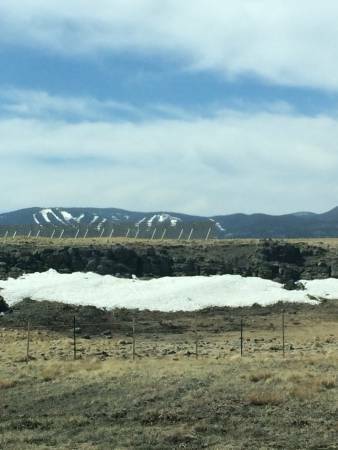 The drive was very scenic, heading through into the Sangre de Cristos Mountains. It is a very small unit, with friendly staff and few displays open to the public. They raise Gila Trout, a species native to the Gila Mountains, in southern New Mexico. 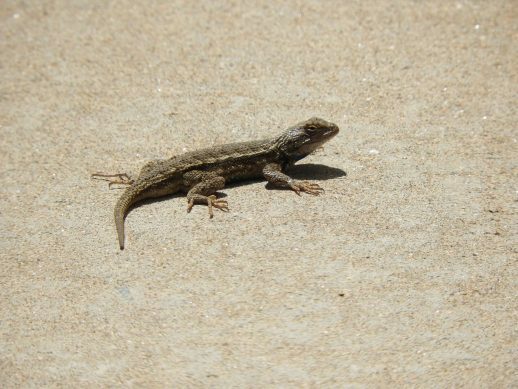 Besides viewing some birds on the ponds we got a good view of a lizard on the grounds. 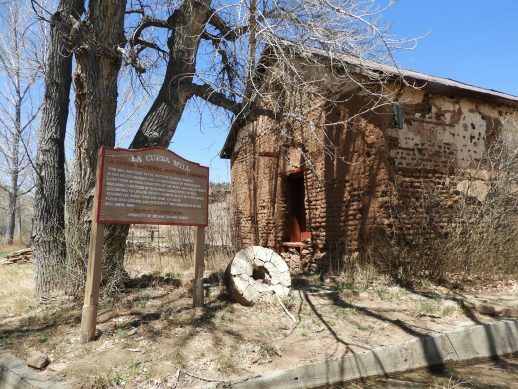 On our way to Mora we passed La Cueva National Historic District. 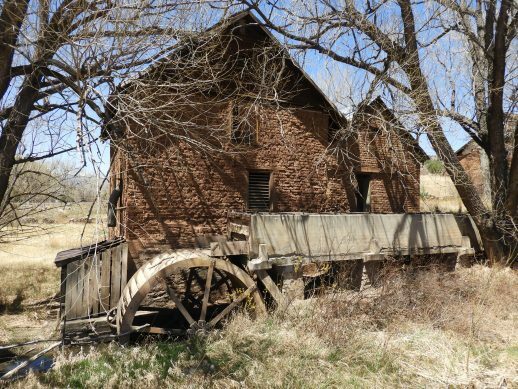 We stopped on the way back to check out a few of the abandoned buildings, including an old grist mill dating to the 1870s, which served as a supply point along the Santa Fe Trail. This was fun discovery along the route. We were now planning to head south, to central New Mexico. Sometimes a mistake, or a missed exit can be a fun adventure. We intended to take US 54 south to Carrizozo, but we zipped by that. After checking the road atlas map and Google maps we headed south on NM 3. It was a fun drive through several traditional villages following the Pecos River at the beginning, eventually crossing grasslands back to US 54 and Carrizozo. The best part of the route was the lack of traffic and good pavement. 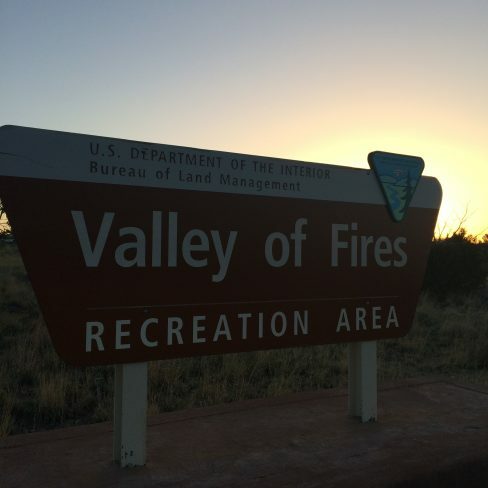 Our goal for the evening was Valley of Fires Recreation Area, a BLM site with a developed campground, a few miles west of Carrizozo. The wind seemed tolerable as we fixed dinner, but changed direction and got stronger as we settled in for the night. First Look at Rick Quinn's new book!